In BMO Online Inventory, it is useful to have stock adjustment prefix and suffix number templates so we can track all stock variance changes. You can change the stock adjustment Prefix and Suffix in BMO Online Inventory Management System by following the steps as shown below. 1. 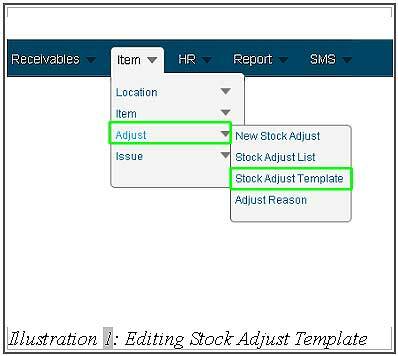 Click on the “Stock Adjust Template” (Item > Adjust > Stock Adjust Template) on the navigation menu bar. 2. 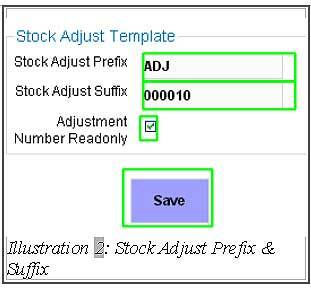 In the “Stock Adjustment Template”, you can see the “Stock Adjust Prefix” and “Stock Adjust Suffix”. You can change or leave it as the default prefix and suffix. The “Adjustment Number Readonly” when checked, the stock adjust number will become just read only, else is not read only. Click on “Save” to save the configuration. 3. A window will pop up after clicking the save button. Click “OK” to dismiss the message and continue.